Department store chain Nordstrom is continuing its slow-yet-steady emergence into mobile with the commencement of mobile check-out in its retail locations. 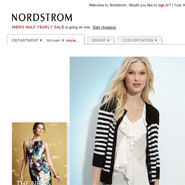 Sales associates are now able to look up past purchases via the iPod touch and spend more time with consumers on the floor, which will probably boost Nordstrom’s already-lauded customer service reputation. Nordstrom has not made many moves in the mobile arena, but this in-store incorporation will certainly help.